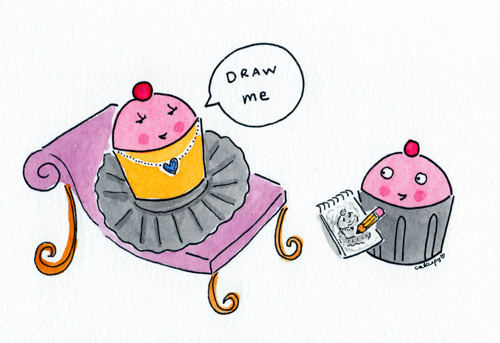 Which begs the question--what was on the Titanic's dessert cart? Recently, I had an opportunity to find out. I was contacted by a promotions company connected to Las Vegas's Titanic: The Artifact Exhibition, inquiring if I'd like to post some Titanic recipes for Thanksgiving. Well, the recipes they sent were all savory, not quite right for me, but when I gently noted that I only post dessert recipes on this site, I got a most excellent series of recipes in response, from the fantastic book Last Dinner on the Titanic: Menus and Recipes from the Legendary Liner . 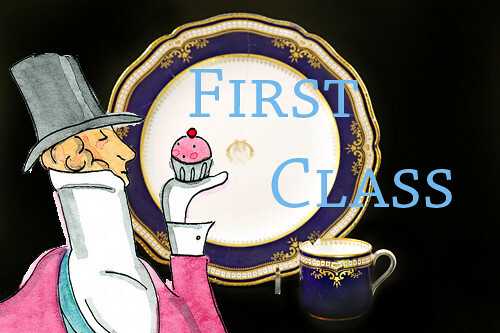 Below you'll find updated versions of sweets served in First, Second, and Third class on the Titanic; each recipe also features a picture of the actual dishware used in each class. Just to make it completely clear: the cupcake illustrations are not meant to trivialize the tragedy which occurred on the boat, but are more meant to celebrate the lifestyle on the boat before it hit the iceberg. 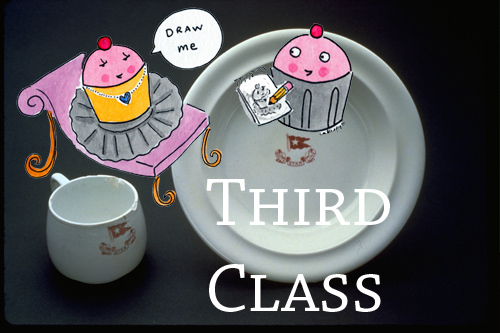 First Class (image of dishware at the top of post). As the headnote reads, "Of the many authentic Edwardian recipes we researched for this book, Waldorf pudding was one that eluded us. The recipe here is a modern invention based on three of the essential ingredients in the famous Waldorf salad--walnuts, raisins, and apples." Thinly slice the apples. Stir in raisins, lemon juice, and ginger. In skillet, melt butter over high heat; add apple mixture and cook for 1 minute. Stir in 2 tablespoons of the sugar. Cook, stirring often, for 3-4 minutes or until apples are lightly caramelized. Scrape apple mixture and syrup into 10-inch round glass baking dish. Reserve. Meanwhile, in a saucepan set over medium heat, heat milk just until bubbles form around edges. Whisking constantly, add some of the milk to the eggs; mix until well incorporated. Add remaining milk, nutmeg, vanilla, and remaining sugar; mix well. Pour over apple mixture. Set baking dish inside a large roasting pan; pour enough boiling water in roasting pan to come halfway up the sides of the baking dish. Place in 325 F degree oven for 45-50 minutes or until custard is set, but still jiggly in the middle. Carefully remove baking dish to cooling rack; sprinkle with walnuts. Cool to room temperature before serving. Makes 6 to 8 servings. 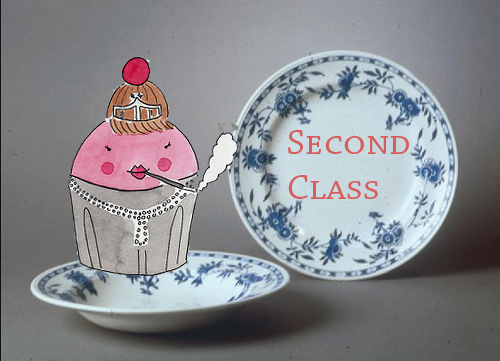 Second Class was still pretty fancy, just not as tricked-out. One of the things at their table at dessert-time? American-Style Ice Cream! "At the time of the Titanic's maiden voyage, ice cream was extremely popular in both France and the United States. In France, egg yolks were added to make the mixture both richer and smoother. The American style, without any eggs, was popularized by Dolly Madison after her husband became president in 1809." In a small pot or microwave-proof dish, combine sugar, lemon juice, and salt; heat over medium heat until sugar is dissolved. Meanwhile, in a heavy-bottomed saucepan, combine light cream with lemon zest; heat over medium heat for 6 to 8 minutes or until small bubbles start to form around the edges of the pot. Remove from heat. Whisk sugar mixture and whipping cream into lemon zest mixture until smooth. Place in refrigerator uncovered; cool completely, stirring often. Pour mixture into ice-cream maker and proceed following manufacturer's instructions. Or, pour mixture into a chilled, shallow metal pan; cover and freeze for about 3 hours until firm. Break up into pieces and transfer to food processor; puree until smooth. Pour into chilled airtight container; freeze for 1 hour, or until firm. Soften in refrigerator for 20 minutes before serving. Makes 3 cups; serves 6. "A staple of English Tea, these buns would have pleased the palates of the many british emigrants traveling in third class." In a small bowl or measuring cup, combine warm water and 1 tablespoon of the sugar; sprinkle yeast over top. Let stand for 10 minutes or until frothy. Meanwhile, in a large bowl, blend together remaining sugar, flour, and salt. In a small bowl, whisk together the milk, butter, and eggs. Stir in the yeast mixture until combined. Make a well in the dry ingredients; using a wooden spoon, stir in yeast mixture until a soft dough forms. Turn out onto lightly floured board. Knead for 8 minutes or until dough is smooth and elastic. Transfer dough to a large, greased bowl, turning to coat. Cover with plastic wrap and let it rest in a warm place for 1 hour or until doubled in bulk. Punch down; turn out onto floured surface; knead in currants. Shape into a 12 inch long log. Cut the dough into 12 equal pieces. Roll pieces of dough into smooth, seamless balls (I laughed when I read this part, btw). Place buns (I laughed again) on greased baking sheet, leaving about 2 inches between each bun. Cover loosely and let rest for 30 minutes. Bake in a 400 degree oven for 15 minutes or until golden brown. Stir together icing sugar and water; brush over warm buns; let cool on rack. Makes 12 buns.